It probably doesn't come as a surprise to anyone that my house doesn't always look like the pretty pictures I usually post on this blog. In fact, I sometimes look at this very blog that I myself publish just to remember what our house can actually look like when I tidy everything up. But the truth of the matter is, we actually live here and it would be sad if we all weren't able to make our messes everyday. First and foremost, like most parents, I want my kids to have the best childhood we can give them. I want them to remember a mother who was present, not one who was always worried about the tidiness of our house. I want them to have space to be creative. To be themselves. And let's not forget our two beloved dogs that are such an important part of our family. I want them to be comfortable too. :) And so I present for your viewing, my perfect mess. This is what a random weekend morning looks like in our home. There are toys, books and skateboards strewn everywhere. And for the older kids? Well, it's not toys that they leave around, but their technology. Laptops, tablets, chargers and cell phones galore. And of course the dogs are in the middle of it all. But this is the stuff of life and my heart is full when all of my boys are at home. But I also must admit that I enjoy living in a space that is pleasing to the eye. Which is where good design comes into play. All of the bigger ticket items in our home, like flooring, paint colors and furniture, are chosen with the scene above in mind. That is why it is so wonderful that STAINMASTER® makes flooring products that are made to stand up to the wear and tear of everyday life. So we can live comfortably and still maintain a home that we are proud of. In fact, STAINMASTER® wants to see pictures of all of our perfectly messy homes, yours included. You can find our more info about their My Perfect Mess campaign here. And be sure to read to the end of this post for details about their fabulous giveaway! 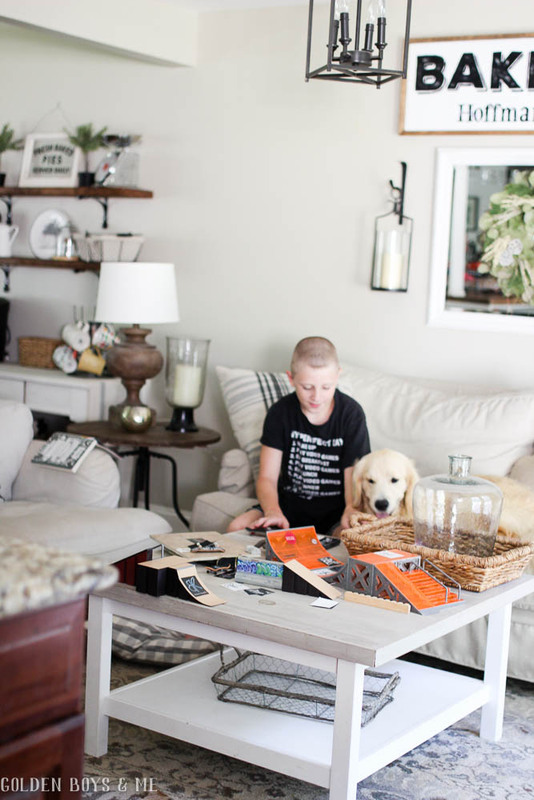 I have found (through lots of trial and error) that if I choose items that are easier to clean, I don't have to worry as much about the messes that we all make together. I think we all agree that it's in the messes that the real stuff of life happens. We adore our dogs but they certainly add to the mess around our home. I am sure you can relate if you have pets too. 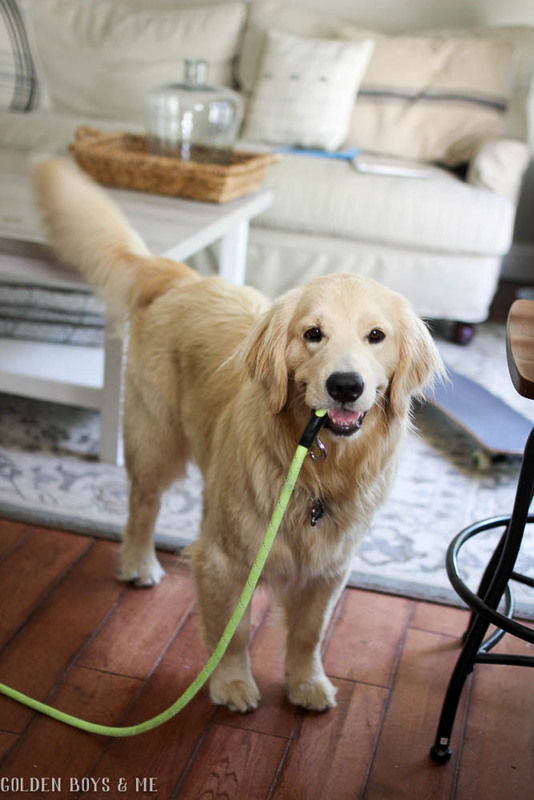 Our pups are golden retrievers and, let me tell you, they both live up to the "retriever" part in their breed. 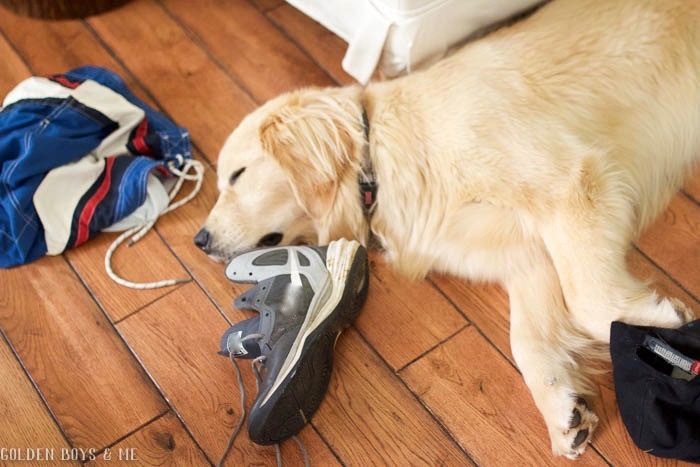 Our puppy, Dax, enjoys bringing our dirty clothes downstairs from the laundry bins in our bedrooms and sleeps surrounded by the kids' shoes and clothing. Now that I have shared my perfect mess, dirty laundry and all, it is your turn. STAINMASTER® wants to see what your perfect mess looks like. Simply post pictures of your perfect messes using the #MyPerfectMess hashtag and tag @STAINMASTER in the caption. Oh, and did I mention that three lucky winners will be given free carpet for one room in their home PLUS a $500 retail gift card?! Be sure to check out the My Perfect Mess page to get all of the details. *This post was sponsored by STAINMASTER®, but all thoughts and opinions are my own. What a lovely family. Enjoy your boys, they will grow up and take their flight way too soon . Love your Goldens ! Even "messy", your house is beautiful, Courtney! 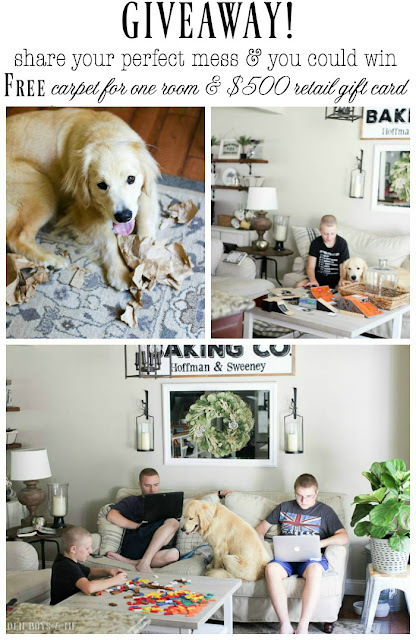 I agree that having the whole family around making messes and enjoying their home is what makes a house a home. 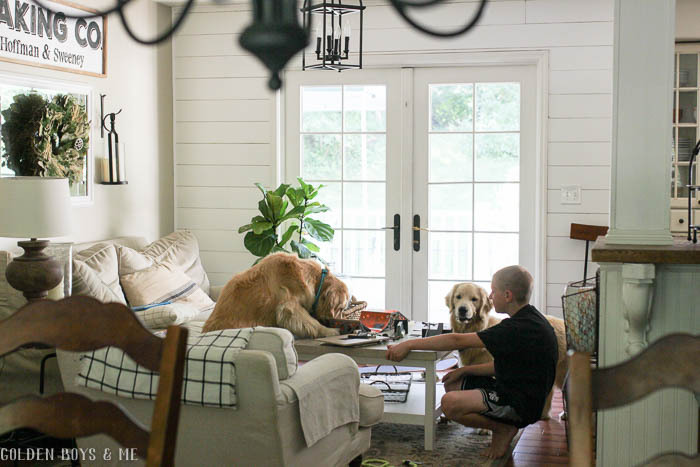 Love this post and I love seeing both goldens right in the middle of it all! I can relate to the underwear thing as well. Sometimes Rosie sneaks up into my bathroom after I have taken a shower, steals my underwear and then proudly carries it downstairs. Luckily, it hasn't happened when company is over but it's only a matter of time! 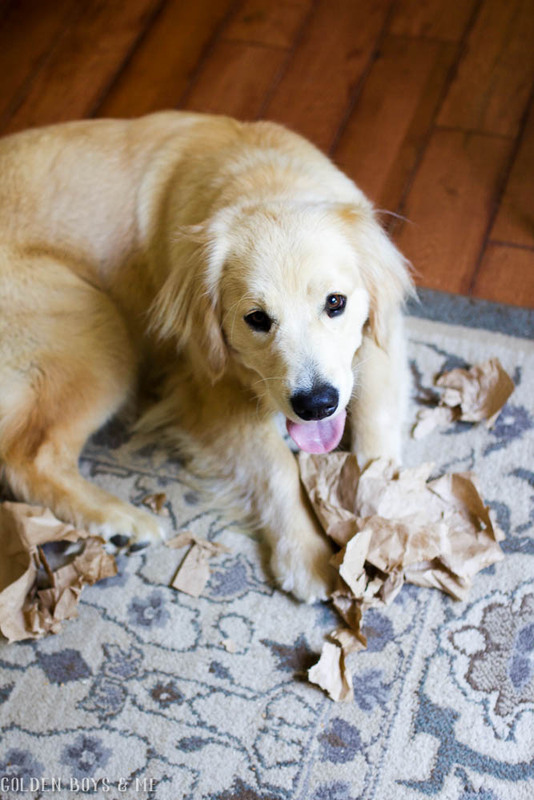 Those silly goldens! Enjoy your weekend...and great giveaway! Hi, i was wondering where your sofa came from. Thank you much. Hi Chris. 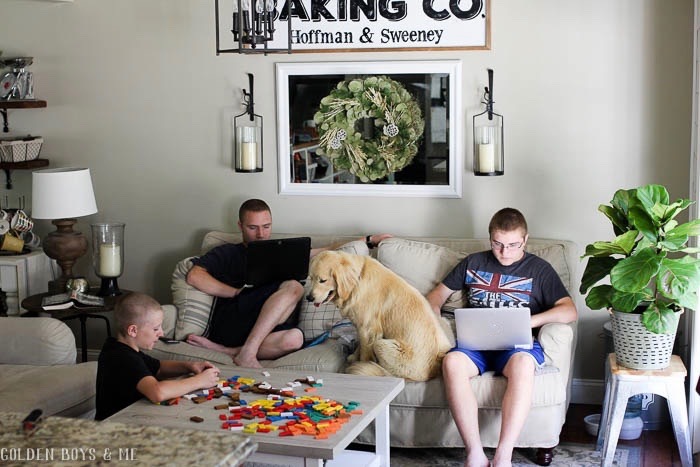 The sofa was purchased online from Birch Lane. It is the Montgomery Slipcovered Sofa. Hope that helps! In the event of a hurricane, it is critical to know what to do not only for yourself, but for your pets as well. Find our which steps to take to ensure that your pet will be taken Cat names of in the event of a hurricane or disaster evacuation.